has six branches in Missouri and Kansas and thousands of ATMs nationwide through its CO-OP network. It offers business savings and checking accounts, direct deposit, and insurance. We compiled United Consumers Credit Union reviews and found that it is rated A+ by the BBB and 4.5 stars on Deposit Accounts. United Consumers Credit Union is open to anyone who lives in Jackson, Buchanan, Cass, and Clay Counties or the city of Cameron, Missouri, as well as those who live, work, or worship in Johnson County, Kansas. Immediate family members of current account holders, such as spouse, sibling, parent, grandparent, child or grandchild, are also eligible to join. Ready to get started with United Consumers Credit Union business checking? Apply now. United Consumers Credit Union has five branches in Missouri and one branch in Kansas. It is also part of the CO-OP network, which provides its members access to shared branches and over 9,000 surcharge-free ATMs nationwide. You may view its branch locator to check which locations are closest to you. 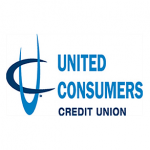 United Consumers Credit Union also offers business savings, money market accounts, and credit cards. Although it offers personal loans, it currently does not have business loan programs. Find out more about its small business offerings on its website.